As a nanny and teacher I worked for 17 years with all different sorts of parents, but usually households were either No TV or Constant TV. I hardly ever saw a middle ground. I think that it is because, like sugar, the screen is a slippery slope. Before becoming a parent, my preference was that my child didn’t see a television (or iPad or iPhone) screen until at least 7 years old. For my family it started so innocently. We had to distract her just long enough to get the tangles out of her very curly hair. Then two things happened: Other family members wanted to share the joy they found in technology with my daughter, and I started a second business and became a work-at-home mom with not enough childcare and occasional sudden moments of needing to be able to make a phone call. There are all sorts of ways to negotiate and regulate screen time with older children — charts, cards, offering other super-fun activities — and there is even an app to manage screen time on mobile devices. For older children, doctors often advise that parents can be more lenient on tech with a child who does well in school and plays frequently with others. But what about toddlers? I’d like to pretend they aren’t getting screen time, but let’s face it, they are. 1) Is It Truly Educational? Limit the type of programming and stick to it. One option is to cancel cable or stick to PBS Kids and, within that, research the shows that you approve of and think are educational and age-appropriate. You may also ask yourself if the programming is not challenging your youngster but merely entertaining him. Not every show that calls itself educational really is. Does it teach a skill? How well? Shows that teach one word of Spanish in an hour don’t really cut it for me. Delete apps that you feel are not educational or which your child has grown out of. Be careful to avoid fast-paced cartoons as they are proven to negatively affect the brain and disturb the ability to concentrate. 2) Is It Expressive or Intuitive? Expressive art on an application lacks severely in the sensory aspect, but I still consider graphic design artists artists. Intuitive applications teach a skill and the skill gets harder as a child masters the skill at hand. To know if a show is educational, expressive, or intuitive, we might watch it or play it ourselves the first couple of times with our child. Research shows that children learn better from these applications when a parent interacts with them, but I will not belabor the point because I know that most of us are using the screen as a way to have a break/wash a dish. I kept the quizzing apps that progress with the child and the art apps mostly for the airplane rides. 3) Use Appropriate Time Limits. The American Academy of Pediatrics recommends that children under 2 have no screen time at all and for children between 2 and 3 years of age to have between 30 and 60 minutes at the maximum. But parents are confused by this, and most kids are already having screen time before 2 (especially with older siblings). I coach parents to use my 10-minute rule: Ten minutes per ever year of life. An 18-month-old would get no more than 18 minutes per day (probably on an interactive app, because shows are longer than 18 minutes). A 2-year-old can have up to 20 minutes a day on an app or 20-minute show on Hulu (no commercials or you can skip commercials or turn it off and sing a song together for a few minutes). A 3-year-old watches one full 30-minute show per day or less. 4.) Plan a Transitional Activity: The main reason I wish my own child’s screen time had never started? The “taking it away” part of setting a time limit. Tell the child before they begin screen time what they can expect to come after. “Then we will read stories together.” Or, “then, I will find you a snack!” Also, try to check in as your child is nearing the end of screen time with a “Show is almost done, then we eat…” reminder message. 5.) Detox from Screen Time: Spend an entire vacation together without screen time. Plan an entire weekend full of activities without screen time. Plan a day of the week that is screen-free. Always have a way to go back to what it is like to be a family together without the crutch of screen time “for parental work emergencies/migraine…, etc” since a parental emergency is quite sure to come up every single day (understanding wink!). 6.) Avoid Mixing Food and Screen: It can be so tempting to spoon-feed a picky toddler while they are mesmerized by the screen, but don’t! We want toddlers to learn how to feed themselves, to pay attention to the process of eating, and to recognize when they are full. For adults, we know that television watching increases the risk of obesity and that mixing television and food further increases the risk. As a child, I had a mom who worked in tech, and therefore I had earlier access to computers than most people my age, and I lived in a house of limitless TV. I’ve finally gotten clear with myself that I don’t think it ruined my brain and the only place I think it hurt was in body image. But I still have to balance the fact that it didn’t ruin my brain with the wealth of knowledge and studies that now say that excessive screen time is harmful for youngsters. Screen and School? I have seen that tons of preschools and kindergartens are now using video and computers as teaching aids. I own and direct a preschool, and I just don’t agree with screen time in a learning environment for very young children — most children are getting plenty of screen time at home. We go to preschool to practice social interaction, and I feel that screen time is definitely the opposite of social. I prefer teachers — real human beings — to teach our children. Nobody is a bad parent for letting a 1-year-old play with an iPhone. And yet, we can effectively limit and monitor screen time for our children in a smart way and avoid extremes. If we do so with consistent boundaries, our children will grow up seeing the screen just as a learning tool and and not as best friend. I’ve yet to say any conclusive studies that show any kind of negative affect of media on the brain. I have seen studies that indicate that certain types of video games, in fact, can improve sight and coordination involved with driving. But as for negative effects, I hear lots of sociologists, crunchy moms, and old people bemoan the ill effects of it but it is all pure speculation. And most of it seems to come from people who just *don’t like* media for some reason. Because kids are spending “too much” time doing it. Yet they don’t define what “too much” is. They just don’t like it. However, studies do show that there is no real benefit, developmentally speaking, media exposure prior to age 2. We also know from cognitive and social research that babies and young children need LOTS of interpersonal interaction and “face time” in order to develop socially and cognitively. Any time spent staring at objects on a screen is going to detract from that. Your second paragraph is I think exactly what Moorea is trying to say since it’s about screen time “for tots.” She links to several relevant studies in the article, and you could find more here: http://scholar.google.com/scholar?as_vis=1&q=negative+effects+of+television+children&hl=en&as_sdt=1,48 I agree that there’s a dearth of research on what “too much” screen time is; many studies are of short-term viewings, but some are of TV diaries. However, kids are exposed to so many more screens than just TVs nowadays, and I know my five-year-old tends not to want to look away from screens if he can avoid it. For people like us, I’m glad articles like this can give me some simple guidelines to consider. I’m definitely not anti-screen time, nor do I think my own computer use and TV viewing has affected me negatively, with a few exceptions. (For instance, I’m sure I’d be more efficient with no screen time — but also probably sad to miss out on my vegging and the social interaction that comes through the computer especially.) Our family does a lot of screen time for the older members, but we do try to keep it to a minimum when our kids are very little. I’ve been thinking lately that I’d rather have a higher quality of non-screen time in our lives. I know some families don’t feel the need to limit or are satisfied with the limits they already have in place, but I’m going to consider these guidelines as we craft our own. Proof or no proof, common sense tells me that my kids’ time is better spent NOT staring at a TV screen. I admit my kids watch entirely too much TV and I want to change that but it is such an easy way to get a few minutes peace. As much as I don’t practice what I believe, I do know that every hour spent watching tv is an hour spent not living. I admit I am what Bridget calls a “crunchy mom” and I tend to see screen time as replacing valuable quality time. I prefer reading books, walking to the park, playing with my kids, or just letting them play on their own for entertainment. I appreciated this article because my kids are exposed to Ipads at Grandma’s and computer games and shows for entertainment almost daily. I think the article addresses how to deal with the conflicts (especially the tantrums that come with turning these things off) very well. There is another good article on WIRED http://www.wired.com/wiredscience/2011/10/infant-tv-guidelines/ which deals with screens and toddlers in a way that might appeal more to screen-loving parents. For me the bottom line is that screen time takes away from normal child development and should be treated cautiously. My daughter will be two next week, and her screen time varies between 0-100 minutes/day, with the bulk of days falling in the 0-30 minute range. Today, however, she watched more, because she is sick and I wanted to help keep her calm. I will also turn the channel from something that she wants to watch to something that I want to see for 20 minutes or so to try to teach her about taking turns. She’s been surprisingly responsive to telling her that if she whines/cries when the tv goes off, we’ll avoid the outbursts by not turning on the tv/tablet in the first place. One way we limit screen time is by actually not allowing any TV. I downloaded some old Sesame Street shows and a couple movies (like The Red Balloon). My 3yo is allowed to watch one show during quiet time (since she no longer naps and we don’t have the space for her to spend time alone playing – our kids share a room and the youngest still naps). I like that she ends up watching the same shows again and again – she ends up learning the songs and talking about the different things she’s seen (I’ve seen all the shows as well). 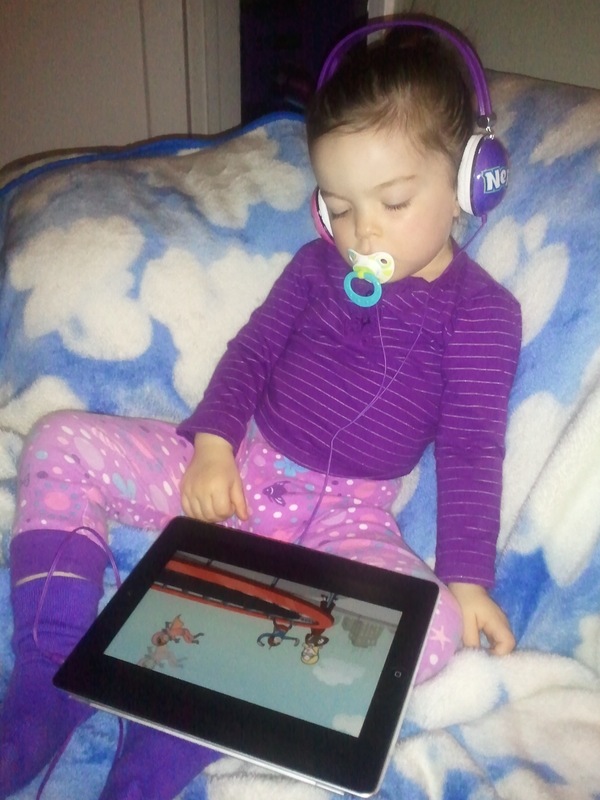 It’s not perfect, it’s not no screen time, but it works for us and I feel comfortable with that level of screen time. We have also found that audio stories are great for replacing screen time – the original Winnie the Pooh, Juanita the Spanish Lobster (look it up! ), Peter and the Wolf, and Sparkle Stories are among our favorites!